AlivePromo > News > Town Square in St. Paul updated with AlivePromo Digital Directories. August 1, 2016 – St. Paul, Minnesota – Town Square in St. Paul updates directories with AlivePromo, Inc. systems. 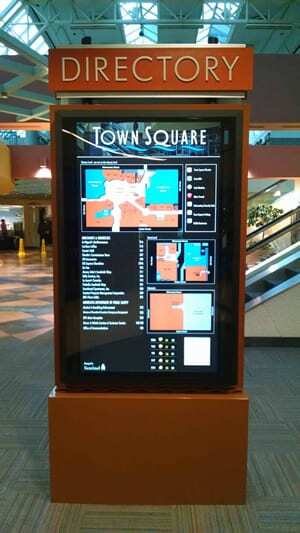 Town Square in St. Paul, Minnesota looked to AlivePromo to convert several types of back lit directories to digital. The older directories included a series of wall and pedestal directories serving several areas of the large downtown complex. AlivePromo added a new pedestal for its office tower and converted older pedestal directories in the retail/food court areas. The client, Sentinel Property Management Corporation, can update the content on each directory using AlivePromo’s AlivePulse™ content management system.